Here is a brief description of a significant new opportunity for the development of affordable large-area, flat-panel displays for consumer applications. On this page you will find the abstract and a block diagram from a patent application that I filed with the US Office of Patents and Trademarks on September 5, 2000. It issued on March 18, 2003 and can be viewed here. If you find it interesting but are not actively developing large-area displays, please notify others who may be interested in such an opportunity. In any case, please contact me with your questions or comments. 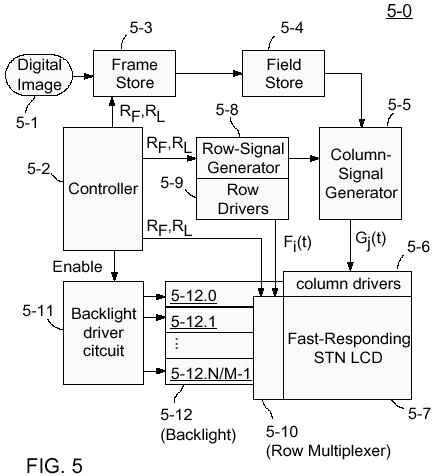 A low-cost, large-area display system having a backlight in segments each positioned to illuminate a subfield of M rows of a fast supertwisted-nematic (STN) display of N rows. Fields of Q+1 subfields are addressed by the method known as Active Addressing using orthogonal waveforms of period MT/N where T is the frame time. A subfield is addressed for Q+1 periods MT/N of the row waveforms and illuminated during the last one. Fast STNs allow Q to be small leading to a small effective multiplex ratio with improved contrast and horizontal viewing-angle range. A few additional leading and trailing rows may be addressed to overcome vertical parallax. The row drivers are periodically connected by switches that simply ground un-addressed rows. With Q+1 also a divisor of N, subfield contributions to the column waveforms can be calculated once and used Q+1 times in each frame. For example, N=240, M=16, L=4 and Q=2 provide an effective multiplex ratio of 57 and allow at least 2.2 msec for pixels to turn on when the frame rate 1/T is 60 Hz. The viewing-angle range can also be expanded by moving subfields a few rows in the scan direction and advancing the integration time to equalize the brightness of pixels illuminated by the next segment. For example, if the turn-off time is 0.76T and the integration time is shortened to 0.33MT/N, equalization is possible with turn-on times as large as 3/4 of the turn-off time without decreasing pixel transmittance by more than 50%. Dual-scan configurations using N=240, for example, can display VGA or 480p formats.